We’re small. We’re local. We live here. We work here. We’re involved in the community. That’s the message of Small Business Saturday, which returns this year on November 27. This annual salute to small business launched in 2010 to encourage consumers to venture out into the community and patronize local merchants. Tucked between the much-hyped, massive bargain-hunting day after Thanksgiving madness that is Black Friday and the online mega-shopping event that has become Cyber Monday, Small Business Saturday may seem like an odd, small potatoes event. But that’s the real magic of it. While getting up at dawn to wait in line to be one of the chosen few to get deals of the century on mass-produced items may be some folks’ idea of fun, or cyber-shopping for hours may appeal to others, who can resist the idea of exploring small shops and seeking out handmade, artisanal, local and unique treasures? It may seem a little crazy to be staging a special event during the long Thanksgiving weekend, but when you stop to consider, it is the launching pad for the winter holiday season when there are plenty of opportunities for gift purchases and celebrations. 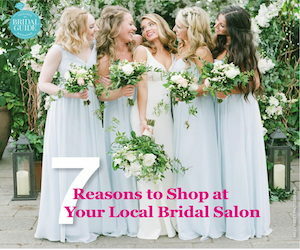 And for bridal retailers, it’s an opportunity to showcase your store while demonstrating neighborhood and community spirit. Small Business Saturday is the perfect time to introduce yourself, according to Ann A. Fishman, author of “Marketing to The Millennial Woman” (Ann A. Fishman Generational Targeted Marketing LLC, 2015). First, however, you need to decide what your goal in participating is. Most likely, attracting customers and making money is at the top of the list. Fishman suggests that Small Business Saturday is the perfect time to target younger generations, including Generation X and Millenials. “Do things that appeal to this huge number – there are 40 million Millenials, the largest generation since the Boomers,” she says. You might be wondering why you should focus your Small Business Saturday efforts on catering to millennials. After all, these young women aren’t going to stop by your store “just because.” They need a reason, and why would they even consider shopping at a bridal store if they aren’t in a wedding or don’t have an engagement ring on their finger? The answer is simple: Because these young women are fashionistas, Fishman says. There also is a trend among college-age women to dress up for Date Night, Fishman says. These are the customers being appealed to in the current Walgreens television ad, which shows a woman getting made up and putting on a cute little outfit for her stay-at-home date with her significant other in front of the television, probably on Movie Night. Enlist the aid of a millennial to design the vignette, sitting area or display. You want create an area where shoppers can sit inside surrounded by something beautiful and take a selfie. The great news about this generation is that Millennials want to do your PR for you, Fishman says. “They want to talk about you to their BFFs, their acquaintances, and frankly, to anyone who will listen,” she says. So, in addition to reaching out to the younger generation, what else can you do on a large or small scale to be a part of Small Business Saturday? Below are 10 more ideas you can put into play. Remember, the fact that shopping local and shopping small has become a growing part of many consumers’ lifestyles gives you a solid platform for promoting your local brand. 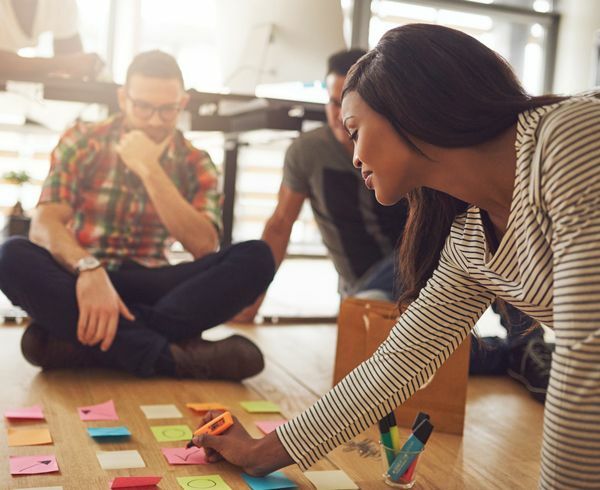 It’s becoming increasingly easy for consumers to buy into the idea of giving their business to someone who lives and works in the community, too. 1. Team up. Small Business Saturday is a great opportunity to pool resources. Team up with other local businesses to increase your promotional budget for the event. Even if you are not officially part of the national effort, you can create your own version of it. Combined marketing budgets could create a listing of participants, locations and what’s happening at each site during the day. Press releases and interview requests will have added impact. It will be a more interesting assignment for the media than just recapping tales of all the bedraggled shoppers who survived Black Friday and are at home soaking their feet and perusing their finds. 2. Show off. On a day when the spotlight is on shopping small at local businesses, independent bridal retailers can parlay the “shop small, shop local” message to introduce or re-introduce their business, increase foot traffic and support other small merchants as well. Develop a creative promotion, something that can separate your marketing from the barrage of holiday gift-shopping retail advertising. 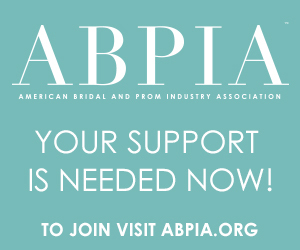 If it’s feasible, put a trunk show, sale, fashion show or mini bridal show on the schedule. While you probably don’t have the time or space to put on a full-fledged bridal show, you can invite other wedding vendors with whom you have a working relationship to be represented, perhaps in a window display. If you’re planning to have some form of giveaway, consider including brochures or information from these businesses as well. Create one amazing window to attract the attention of shoppers, especially those millennials. Design a cool space that can serve as a “selfie” backdrop. Enlist the help of a savvy millennial to get an idea of what’s considered beautiful, interesting or cool. Try to select something current. For example, if the event was happening now, you might want to tuck a Pokémon Go reference into a display. It doesn’t have to tie into SBS, but if you can find a way to connect, even better. Because it is Small Business Saturday, there will be more foot traffic and drive by because folks from the neighborhood and nearby towns will be exploring shops they’ve never visited or making a return visit to support small shops they usually patronize. 3. Invite them back. Give shoppers a tangible reason to revisit your business. Print up a “no expiration date” coupon that SBS visitors can use at a later date. You can determine the format, but experts advise creating a beautiful coupon on good paper, something that people are more likely to value and hang onto. What the coupon can be used for and its value obviously can be determined by each individual store. 4. Bag it. Distribute sturdy, reusable shopping bags like the ones encouraged in areas where resource conservation is championed. Shopping bags are one way to get your name out there and have it on display for months or years to come. Use your store’s signature colors and use the bags for any planned giveaways. 5. Offer refreshments. One bridal store found great success last Small Business Saturday by setting up a gourmet treat stand right outside its store to cater to shoppers who were tired, hungry and looking for a break. This store didn’t offer a promotion on any of its dresses, but rather spent the time conversing with people, sharing the salon’s story, and helping SBS shoppers relax. The treats were offered by a local bakery, which was cross-promoted, and water bottles with the store’s label on it were handed out. Not only was it a fun experience but numerous leads were generated that day. The lesson: Not every SBS event has to be about directly making sales. Sometimes just being involved can ultimately have a big impact. 6. Promote it. Put a sign in your front window that says “Shop Small, Shop Local November 27” in the weeks leading up to SBS. Contact the local newspapers, television stations or news blogs and volunteer as a source to talk about why it’s a great idea to explore some of the interesting small businesses in your market area. Suggest that these media outlets include a section in print or on their websites of who’s involved and what kind of activities, events and specials will be on tap (many already do). 7. Raise funds for a cause. Set up an elegant “lemonade stand.” Rather than just providing a free or nominally-priced hot or cold beverage to shoppers, accept donations to benefit a local charity. This is a strong way to reinforce the message that you are small, local and involved in what happens in the community. 8. Picture this. Highlight some of the most popular or picturesque wedding venues in the vicinity. Include photos of your local brides at those locations in social-media posts and in the Event section on your website for several days before and after Small Business Saturday. Your testimonials can be a good source for these same photos to be included in window displays. This is another opportunity to leverage your relationship with other local small business such as photographers and videographers. 9. Don’t forget to follow up! No matter what your level of formal or informal participation, there will be a number of shoppers who have signed up for your e-mail list or decided to follow you on social media. The giveaway materials will continue to pay off, long after the event. For example, if you handed out goodie bags that included a bridal checklist, your name and contact information is on the materials. You’ll probably get inquiries down the line as well as referrals from friends who visited the store even if they weren’t planning a wedding. Take the time to say, “Thank you for stopping in” to anyone who provided contact information. You can use the follow-up call, e-mail or message to alert them to upcoming events. 10. Help others. Even if you decide not to have your shop fully participate in SBS, you can still show your support of the local small business community. You can encourage your customers and social-media friends and followers to visit other small businesses, wedding related or not. It is a good opportunity to spotlight wedding businesses with which you have established relationships, on your website and via other social media. It could be the tiny shop that offers handcrafted jewelry, a small-but-charming flower shop, the local star baker, a talented photographer, seasoned caterer or even a bistro where you send overflow shoppers on busy Saturdays for a beverage or a snack while they wait for an appointment. Sending good vibes their way won’t be forgotten, and could easily pay off in dividends down the road. If you haven’t already, visit the Small Business Saturday website (www.americanexpress.com/us/small-business/shop-small) and check out a plethora of free resources offered to participating stores. You can sign up to receive year-round Shop Small resources; the site also offers insights and tips to help grow your business through articles, videos, member-exclusive content and connections to other business owners. Qualifying American Express® Card accepting small merchants receive additional benefits (the company is the title sponsor); you can also elect to become a Neighborhood Champion, which entitles you to receive a Small Business Saturday Event Kit with branded merchandise to help your community celebrate the day.